The owner of this Gyrocopter was ready to respray the body. He wanted something special, so he called to discuss his options and design ideas. Discussions involving birds & eagles led to the Phoenix, the ancient firebird, which was the most popular choice. 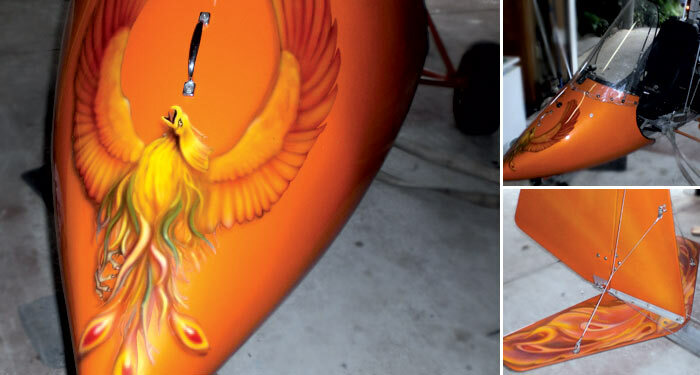 Once in basecoat, the nose cone & tail section were airbrushed with tints of the original colour, producing the Phoenix on the front & a groovy pattern on the tail. Once clear coated & assembled, the Phoenix was ready to fly again! The overall job took approximately 1-2 weeks from design consultation to completion. If you would like to get a free quotation on any ideas that you may have, please contact us.